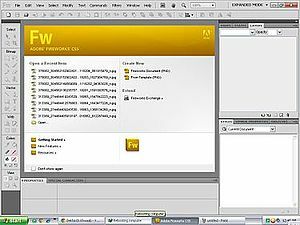 Adobe Fireworks (formerly Macromedia Fireworks) is a bitmap and vector graphics editor. It was originally developed using parts of Macromedia xRes, which Adobe acquired in 2005. Fireworks is made for web designers for rapidly creating website prototypes and application interfaces. Its features include slices and the ability to add hotspots. It is designed to integrate with other Adobe products such as Adobe Dreamweaver and Adobe Flash.